Silence is a rare thing. And so is having the time and opportunity to relax. The world is constantly giving us more opportunities, more information, more variety, more options. Change becomes a constant, enabling us to lead higher-quality lives, travel more, live urban lifestyles and experience more and more. However, the world is also becoming louder and more chaotic all the time. When you experience more, see more and live in higher-density conditions, there are fewer opportunities for retreat and relaxation. Private moments become rarer. Silence is becoming a precious asset. In moments of silence, we can relax and let go. This is what inspires us and is the reason why we have been operating for over 100 years. We need silence, a restful sleep and relaxing moments to restore the energy that we need for our daily lives. We are convinced of this and we work towards this goal every day. And have done so since 1907. 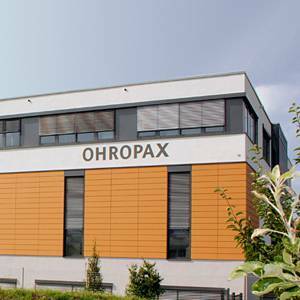 OHROPAX is a small but sophisticated company with clear structures and a very personal approach. Here, practical experience and solution-oriented concepts are more important than complex theoretical ideas. What unites our employees is the conviction that only the highest-quality products stand a chance on the market. And this is why we call on our experience spanning over 100 years and combine it with modern production technologies. Our tradition is important to us. We work consistently on solutions that protect our customers from noise and give them the opportunity to relax or just enjoy some moments of silence. 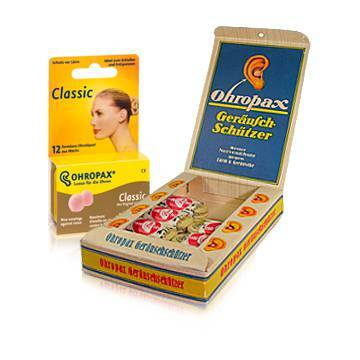 With our extensive product range, from earplugs to sleeping masks, our customers can always find the product they are looking for. They can choose from different materials and shapes in two different styles. To continue to meet our high quality demands in the future, we challenge ourselves every single day. We use the latest equipment for production, some of which we develop and manufacture ourselves. ISO certification offers clarity to our business partners and customers about the high standards that define what we do. We supply customers all over the world from our quiet location in Wehrheim, Germany, and they highly value our products. Their positive feedback and the success of our products on the market provide the best motivation for us to continue developing and manufacturing high-quality products in the future.